Talkboxers like Roger Troutman and Bigg Robb do not only use commercial products but also own custom made Talkboxes. This may be a form of artists pursuing originality. Here, I would like to introduce how to create your own custom made Talkbox. The minimum requirements to do this are 1. Compression Driver, 2. Capacitors and inductors, 3. Cable(s) for connection between components, 4. Tube holder, and 5. Tube. Between talkboxers, Electro Voice 1823M and 1824M are referred to as references. Unfortunately, they are no longer manufactured and auction sites like eBay would be your best choice if you would like to purchase them. If you are not particular about this model, many companies like Monacor or Pyle still manufacture good quality compression drivers. Recent compression drivers are also high-powered and have wider frequency response, so this could be another option. The requirements for compression drivers for talkboxes are having a wide and flat frequency response (true resemblance of the sound) and compatibility with 100W input. These requirements also go for the power amp, so make sure you choose an amplifier that matches the compression driver. Check the compression driver page for more info on compression drivers. Compression drivers are designed to drive mid-high frequencies and do not work well with low frequencies. For example, the 1823M's frequency response is 400Hz-10kHz. Allowing low frequencies directly from the synth (anything below 400Hz) will damage the driver. To prevent damage, you will need to connect a combination of capacitors and inductors (high pass filter) between the amplifier and the driver to cut the unwanted low frequencies. Capacitors and inductors can not eliminate frequencies right at the cutoff frequency, but decreases the level at a gradual slope. This slope is represented in dB/oct (decibel per octave), so when the cutoff frequency is at 400Hz, a slope of 6db/oct would decrease the power by 6dB in a span of one octave (in this case 200Hz), and a slope of 12dB/oct would decrease 12dB in a span of one octave (200Hz). The larger this ratio, the steeper the slope is. If you decide to run high power to the driver and would like to keep low frequencies up to the very limit, you will need something with a relatively high dB/oct. If one capacitor is connected in series to the speaker, it works as a 6dB/oct high pass filter and if an additional inductor is connected parallel to it, it becomes a 12dB/oct high pass filter. 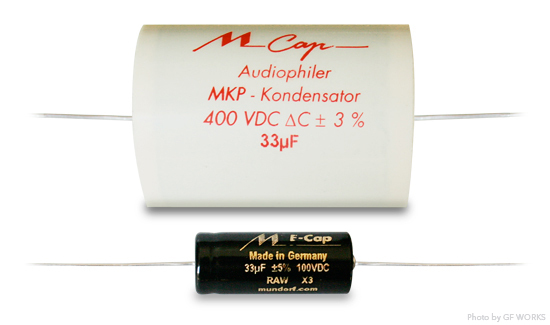 A more complex combination of capacitors and inductors could create 18dB/oct or 24dB/oct filters. Here, I would like to explain how to build a simple, low-cost 6dB/oct filter and a 12dB/oct filter than can run the driver at full-power. For example, in case of Electro Voice “1823M”, “159000 / (8Ohms * 400Hz) = 50μF” so a capacitor with 50μF capacitance should be used. However, because 6dB/oct is a fairly shallow slope, you might want to calculate Fc at 500 ~ 600Hz (40~30μF capacitance) to avoid any damage to the compression driver. For example, in case of Electro Voice “1823M”, “113000 / (8Ohms * 400Hz) = 35μF” so a capacitor with 35μF capacitance should be used. For example, in case of Electro Voice “1823M”, “225 * 8Ohms / 400Hz = 4.5mH” so an inductor with 4.5mH inductance should be used. Electronic components calculated from the above can easily be found in electronic device shops (like RadioShack) or online shops. Capacitors suited for talkboxes are non-polar film capacitors and inductors suited for talkboxes are the coreless inductors. In my case, I use Mundorf “Mcap” film capacitors (Capacity : 33μF / Dielectric strengh : 400VDC) or Mundorf “ECap” electrolytic capacitors (Capacity : 33μF / Dielectric strengh : 100VDC). Capacitors and inductors are necessary to cut low frequencies below the frequency response of a compression driver, so if there are high pass filters on the power amp (like the one from Acoustic Image or if you purchase a crossover network), that will work just as well. Moreover, if you do not play low frequencies on the talkbox, there is no need for capacitors and inductors or a high-pass filter in general. Cables are also available in electronic device shops (like RadioShack) and online shops. With a basic setup, you will need a cable to connect the output of the power amp and the input of the compression driver. In my case, I use Neutrik female phone jack (NJ3FC6), Kimber Kable speaker cable (4PR), and Audio Technica faston jack (TL250L) to connect the power amp to the compression driver. Tube holders are tough to find but if you look hard, you may find substitutes at home appliance shops. 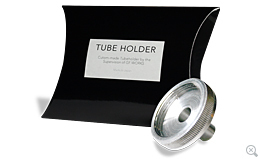 Tubeholders must have an airtight fit to avoid leakage and decrease in sound pressure. Increasing the volume because of these would also result in extra load to the compression driver. Based on GF WORKS' experience and know-how, GF WORKS has decided to offer a complete replica of Golden Throat I tubeholder in a limited quantity. GF WORKS' custom tubeholder is not a modification of a commercially sold part, but is a custom-made model (auto processing and finishing by NC lathe; knurling is handled manually), made in Japan for maximum reliability. Compression drivers has strong magnetivity, so instead of using inexpensive iron, we have decided to use aluminum just like the Golden Throat I tubeholder. Moreover, we have truly replicated the costly knurling for easy screwing and unscrewing of the tubeholder. 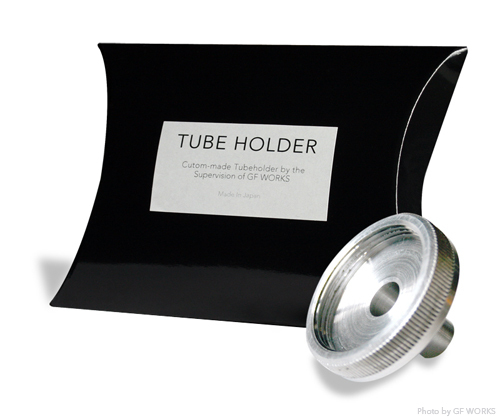 Check out the Tube page for details on GF WORKS Tubeholder. Tubes can be found at home appliance shops and plastic appliance dealers. Needless to say, the tube must either match the diameter of the compression driver or the tube holder attached to it. You could also find a vivyl tube at “GF WORKS' eBay” or Wild Media System's direct online shop. Check the Tube page for more info on Tubes.